Carotid artery disease occurs when the major arteries in the neck become narrowed or blocked. These arteries supply blood from the heart to the brain. 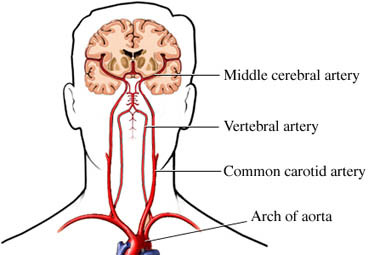 Carotid artery disease is a serious health problem because it can cause a stroke. Cartoid artery disease can be asymptomatic or symptomatic. Carotid artery disease is caused by the build-up of plaque along the lining of the arteries. This build-up is known as atherosclerosis. Plaque is made up of cholesterol, fat, and other substances. Stenting. This type of procedure is a less invasive surgery in which a balloon is inserted into the artery to widen it. Then a metal mesh tube, called a stent, is inserted which expands the inside the carotid artery to increase blood flow in areas blocked by plaque. If you drink alcohol, do so only in moderation. This means having no more than two drinks per day if you are a man, and no more than one drink per day if you are woman.